Krátký, Stanislav ; Kolařík, Vladimír ; Urbánek, Michal ; Matějka, Milan ; Horáček, Miroslav ; Chlumská, Jana ; Neděla, Vilém ; Jaffrezic-Renault, N. ; Krejčí, J. ; Kučerová, R. ; Plička, R. ; Krejčí, T. Differential conductometry biosensors prepared by lift-off technique by using of e-beam writer with shaped beam. In 39th International Conference on Micro and Nano Engineering MNE2013. Book of Abstracts. Cambridge : University of Cambridge, 2013. s. 387. Neděla, Vilém ; Hřib, J. ; Havel, L. ; Runštuk, Jiří. Early state of spruce somatic embryos in native state observed using the ESEM and Cryo-SEM. Microscopy and Microanalysis. 2013, roč. 19, s2, s. 20-21. ISSN 1431-9276. Neděla, Vilém ; Tihlaříková, Eva ; Shiojiri, M. Environmental scanning electron microscope for observation in live nature. In 69th Annual Meeting of the Japanese Society of Microscopy. Osaka : The Japanese Society of Microscopy, 2013. [Annual Meeting of the Japanese Society of Microscopy /69./, Osaka, 20.05.2013-22.05.2013, JP]. Neděla, Vilém ; Tihlaříková, Eva. 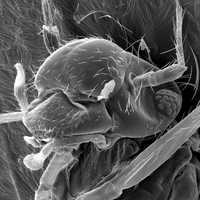 Environmental scanning electron microscope for observation of live nature. In 69th Annual Meeting of the Japanese Society of Microscopy. Osaka : The Japanese Society of Microscopy, 2013. [Annual Meeting of the Japanese Society of Microscopy /69./, Osaka, 20.05.2013-22.05.2013, JP]. Neděla, Vilém ; Tihlaříková, Eva ; Shiojiri, M. New Environmental Scanning Electron Microscopy and Observation of Live Nature. Journal of Microscopy Society of Thailand. 2013, roč. 6, 1-2, s. 1-5. ISSN 2228-9038. Neděla, Vilém ; Tihlaříková, Eva ; Makoto, S. New Environmental Scanning Electron Microscopy and Observation of Live Nature. In MST30 2013. Proceedings of the 30th Annual Conference of the Microscopy Society of Thailand. Chanthaburi : Microscopy Society of Thailand, 2013, s. 19-20. ISBN 978-974-7533-16-3. [MST30 2013. The 30th Annual Conference of the Microscopy Society of Thailand, Chanthaburi, 23.01.2013-25.01.2013, TH]. Neděla, Vilém. SMV-2013-12: Výzkum detekčních principů a jejich aplikace při vývoji speciálních detekčních jednotek pro elektronové mikroskopy. Brno : Ing. Roman Autrata, 2013. 15 s.
Sbartai, A. ; Namour, F. ; Barbier, F. ; Krejčí, J. ; Kučerová, R. ; Krejčí, T. ; Neděla, Vilém ; Sobota, J. ; Jaffrezic-Renault, N. Electrochemical Performances of Diamond Like Carbon Films for Pb(II) Detection in Tap Water Using Differential Pulse Anodic Stripping Voltammetry Technique. Sensor Letters. 2013, roč. 11, č. 8, s. 1524-1529. ISSN 1546-198X. Tihlaříková, Eva ; Neděla, Vilém ; Shiojiri, M. In Situ Study of Live Specimens in an Environmental Scanning Electron Microscope. Microscopy and Microanalysis. 2013, roč. 19, č. 4, s. 914-918. ISSN 1431-9276. Tihlaříková, Eva ; Neděla, Vilém ; Rovnaníková, P. Study of Hydrated Lime in Environmental Scanning Electron Microscopy. Microscopy and Microanalysis. 2013, roč. 19, s2, s. 1644-1645. ISSN 1431-9276. Vyroubal, P. ; Maxa, J. ; Neděla, Vilém ; Jirák, Josef ; Hladká, K. Apertures with Laval Nozzle and Circular Orifice in Secondary Electron Detector for Environmental Scanning Electron Microscope. Advances in Military Technology. 2013, roč. 8, č. 1, s. 59-69. ISSN 1802-2308.